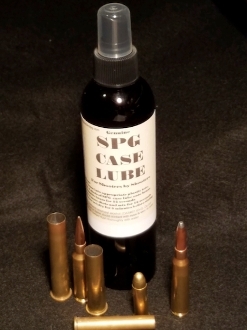 SPG Case lube, 8oz spray bottle. I've been through all the phases, rolling cases on a pad, wiping grease on each individual case, etc. There's got to be a better way. I've worked some stuff up that works real well without all the fuss and work. Just put a hand full of brass in a tubb, like an ice cream container spray a few sprays, swirl around a few times and let dry. I get great coverage without all the work. I'm sure you'll think it's a pretty slick method. Shipping Notice on MULTIPLE ITEMS: Your total shipping charges are based on the shipping method automatically calculated by size and weight, which can make multiple products show a higher shipping fee. Sometimes with multiple products we can ship for less than is quoted on the order form. SPG Sales will reimburse you the difference if we find any over-charge on the shipping and handling costs for your order. We are committed to providing the best possible service to our customers and value your business.